Local people should cooperate with the administration and government for all round development of the Sangdupota Circle- Nabam Rebia. Minister Land Management, Environment & Forest etc and local MLA Nabam Rebia today urge upon the local people to cooperate with the administration and government for all round development of the Sangdupota Circle. Rebia was today addressing a gathering as chief guest on the occasion 1st foundation day celebration of Bassar Nallo Sangtam Ajin Multi Purpose Cooperative Society Limited (BSAMPCS). He said that lots of infrastructure have been created in the Sangdupota Circle which include NIT, TV & Film Institute, Law College, Entrepreneur Development Institute and also the Bassar Nallo Middle School upgraded to Secondary School. Beside that, Jote PHC provided with fund for renovation and up gradation and soon the senior doctor from TRIHMS would visit on routine basis and the local patient will be benefited, he informed to locals. Some portion of the road from Itanagar on the stretch have been renovated. Road from Bassar Nallo to Seijosa will be taken up again , as the contractor have pulled up from the work for several reason, and the proposal for the same have been sent to the government for consideration. The area have avenue and would be slowly developed into a small township next to Itanagar. He urge upon the locals to have patience and shoulder their responsibility and cooperate with the administration and government so that the process of development does not any hindrance at any point of time. Referring to the memorandum submitted by the committee for a Pharmacy, Fair rice Shop and financial support for the MPCS movement in the area Rebia assured to support and also requested the committee members to select a place for construction of office building and he would extend financial support when required. While elaborating 6 principle of the cooperative Amzi appeal the people for support of cooperative movement for its progress and development in various production and service sector. 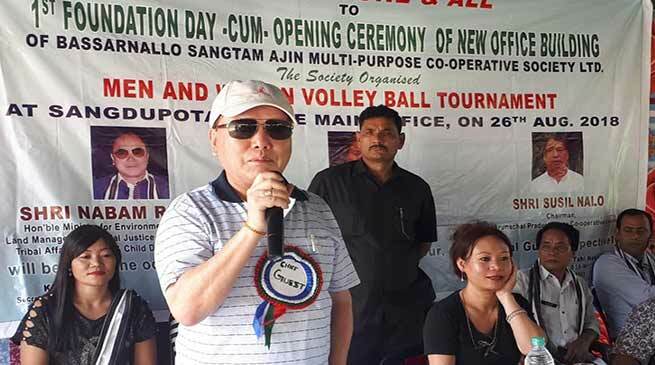 Arunachal Pradesh Cooperative Union President Susil Nalo while attending the function as special guest elaborated various activities undertaken by the department of Cooperation, Cooperative Union and RCS office in spreading of the cooperative movement in the state. he said that the board of director of various MPCS have visited several places twice this year and also to foreign country and again a team would visit few state of south India and China to know about the functioning of the activities. He however appreciated the local MLA for his initiative in all sector of life. BSAMPCS Chairman Nabam Tahi Nekil highlighted the works undertaken by the MPCS till today in the area and also its business activities for promotion and development. Former PRI Leader Gollo Tallo, share holder HN Hina among other also address the gathering. ARCS Techi Kaku, former IMC Councillor Tai Tassung, Bassarnallo HGB Tok Bado and large numbers of local people, youths and women were present on the occasion.